Take heed, though, diabetes sufferers: this is not license for you to chase a healthy, low-cal and leafy lunch salad with a triple-scoop sundae smothered in hot fudge and a box full of melt-in-your-mouth glazed donuts hot from Krispy Kreme. It does, however, crack open a door behind which diabetic for years have punished themselves with a self-imposed sweets moratorium without an end in sight. Happier days are here again, now that nutritionists and researchers are leaning in favor of sweets in moderation, provided that adjustments to compensate are made elsewhere in the diabetic's diet. For example, as suggested at mayoclinic.org, if a typical dinner for you consists of a grilled chicken breast, medium potato, slice of whole-grain bread, a vegetable salad and fresh fruit – but you have your eye fixed on that flirty, delicious-looking cupcake perched nearby calling your name, you have two choices: either trade the slice of bread and fruit for the cupcake, or eat the cupcake after you've replaced the potato with a low-carbohydrate veggie such as broccoli. A little bit of give in exchange for a little bit of take (or cake). "To make sure you're making even trades, read food labels carefully, and be sure to ask your dietitian if you have any questions," says the Mayo Clinic staff. "Look for the total carbohydrate in each food. … A dietitian can also help you reduce the amount of sugar and fat in your favorite recipes. And don't be surprised if your tastes change as you adopt healthier eating habits." One of the trickiest times for diabetics in terms of eating and staying healthy comes when on the road, traveling, whether for business or pleasure. The temptation for the sake of convenience is to eat fast food or go out for sitdown meals every day you are gone, but even careful choices off the menu aren't exactly what a diabetes health professional would recommend. 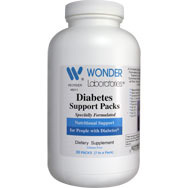 This is where dietary supplements come in as not just something handy but indispensable, such as Wonder Labs' Diabetes Support Packs, sold 30 to a bottle, good for a month. Each of these Support Packs contains a comprehensive assortment of vitamins and nutrients to aid in proper digestion and support of healthy glucose levels, and they assist in providing the right kind of energy to help diabetics get through days when otherwise following strict dietary guidleines might be im practical. It is estimated there are 16 million Americans who have diabetes – formally known as diabetes mellitus (which medicalnewstoday.com roughly translates as "siphoning off sweet water") – a serious lifelong condition, with 800,000 new diagnoses a year. About 123,000 children 19 and under have the disease, which is a metabolic disorder affecting how our bodies process and use digested food for growth and energy. There are two major types of diabetes – Type 1 and Type 2. The latter by far is the most common form, accounting for 90 to 95 percent of diabetes cases among adults. In Type 2 diabetes, insulin gets produced by the pancreas, as it should, but somehow the body is unable to effectively use the insulin. That leads to an unhealthy buildup of glucose in the bloodstream instead of it being absorbed into cells to be used for growth and energy. Type 1 diabetes, by contrast, is an autoimmune disease in which the immune system attacks the insulin-producing cells of the pancreas, destroying them. A person with Type 1, most often a child or young adult, needs daily injections of insulin just to live; Type 2 sufferers, most commonly overweight and over 55, are strongly encouraged to follow a regimen of regular exercise, healthy eating and monitoring their blood-glucose levels. If the disease worsens though, the Type 2 sufferer might eventually have to take insulin in tablet form. A third type of diabetes is gestational, which involves pregnant women. It often goes away after the pregnancy, but women who have had gestational diabetes are more likely to develop Type 2 diabetes later in life than those women who never had it. There is no cure for Type 1 or Type 2 diabetes, but it is not a death sentence, either. Those with either are encouraged to grab a healthy dose of M&M's – Management and Moderation: that is, managing their diabetes through consistently proper treatment and adherence to lifestyle guidelines prescribed by their healthcare professional(s), and moderation when it comes to straying (but just a bit) from their no-sweets menus. Peanut or plain? Makes no difference. Eat up.